It was an exciting start to a new era for The Chocolate Festival. This year The Chocolate Festival has moved indoors, so it was to Islington’s Business Design Centre that I went to see the newest incarnation of Yael Rose’s London festival. 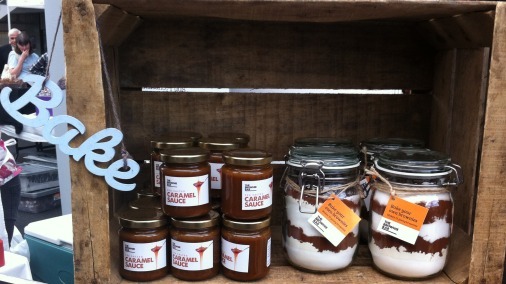 Since 2009 Yael has been championing fine chocolate in the UK, and her festivals have grown to be must-visit events. There are now four; in London, Oxford, Brighton and Bristol, with the London event taking place both for Easter and Christmas. To learn more about Yael and all her festivals do read my article on Yael and interview here. This year Yael has taken the bold move to take things up a notch, moving to indoor venues, where there is space for a host of new extras, and plenty of room to grow. And while the decision to move to a ticketed event, rather than an outdoor one with passing trade, is a tough one, it is clearly paying off, Islington was buzzing. There was something missing though, the wind, rain and biting weather that was often a challenge on the Southbank. 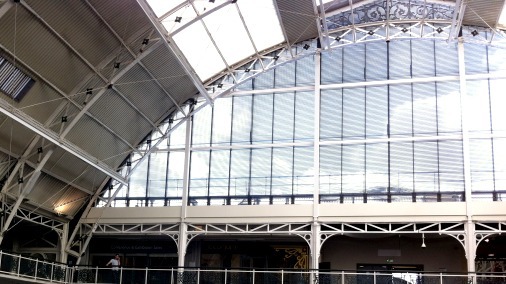 It was all happening under this stunning roof at The Business Design Centre in Islington. The Business Design Centre in Islington is a large, light and airy venue. A very short walk from a tube, and with an area full of great shops and restaurants surrounding it, it is a great new home for the event. Do it yourself brownie kits from The Brownie Bar. One of the new treats in store was a brownie trail, with nine different brownies competing for the honour of best brownie. With a sheet detailing where and what these brownies were, the lucky visitor’s job was to taste them all, and then vote on their favourites. The results now in, the winning brownie was a Double Texture Salted Caramel Brownie from exciting new brownie maker to watch, Bad Brownie. I can confirm that it was properly gorgeous! 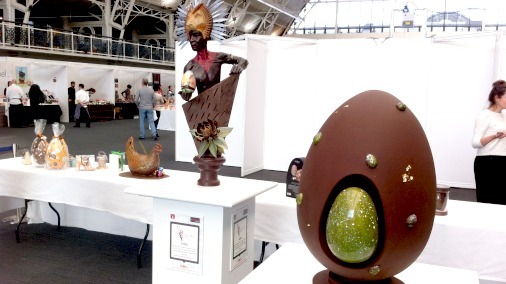 An exhibition of flagship products and chocolate sculpture featured the European Pastry Coupe winning sculpture by Barry Johnson of Rococo. Inspired by The Lion King, Barry had cheekily accessorised his work of art with an Easter egg for the occasion. 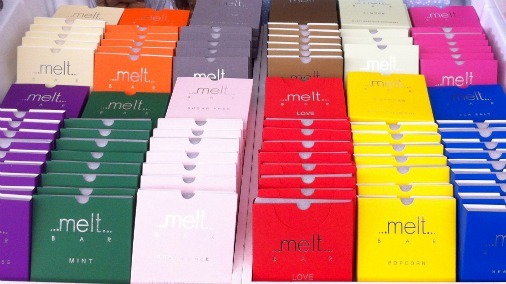 Colourful bars, from Melt in Notting Hill Gate. There were tempting chocolate bars from many of the UK’s top chocolatiers, however it was more a festival of chocolatiers than chocolate makers. 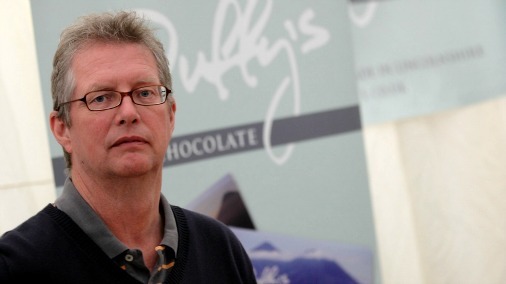 Duffy Sheardown, award winning bean to bar chocolate maker. But with luminary of the bean to bar chocolate making scene Duffy Sheardown present, there was still some very stylish representation for chocolate makers. Duffy was showcasing two new Nicaraguan bars, a Chuno and a Nicaloso, of which I particularly loved the Chuno. He also had a new 100% bar that flew off his stand faster than he could restock it. Martin Christy and Monica Meschini, quite some double act! One of the festival highlights has always been a superb programme of events, with top experts sharing their wisdom. This Easter Martin Christy has been hosting the events in the Seventy% Tasting Lounge, which saw a wide and exciting programme of tastings and demonstrations. 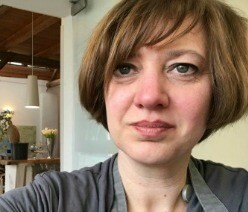 I was very happy to see Italian chocolate expert and International Chocolate Awards Grand Jury, Monica Meschini, combine her expertise in tea with that of chocolate in a dedicated talk on pairing the two. 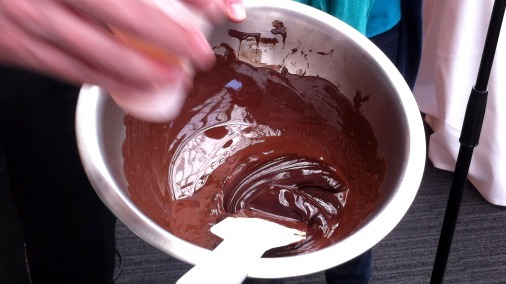 Demonstrating water based ganache techniques. With Martin Christy as her glamorous assistant they whipped up an earl grey tea ganache, demonstrating water-based ganache techniques and giving us something divine to taste. 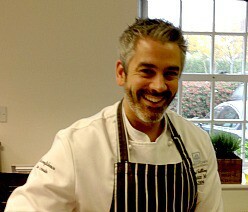 New creations from Damian Allsop, ready for the lucky audience in the Tasting Lounge. Another world class exhibitor and speaker was Damian Allsop, multi-award winning chocolatier, who pioneered the water based ganache techniques that Martin and Monica were using. Damian is now based in Catalan Spain, and it was a treat to catch up with him. Not least because the move has clearly given him renewed energy and drive towards his chosen art. It was a joy to see such talent, whom I have always admired enormously, raise his game even further. 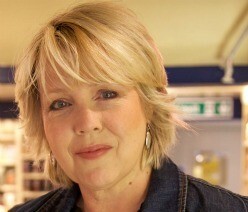 He plied me with the most exciting and interesting new products, some of which are under wraps until later in the year. All I can say is watch this space! Damian gets ready to blow me away! One innovation Damian did have on full view at the festival was his hot chocolate foam. Made with Pacari Raw 70%, without any diluting dairy or additional flavours, this is a chocolate purists dream. 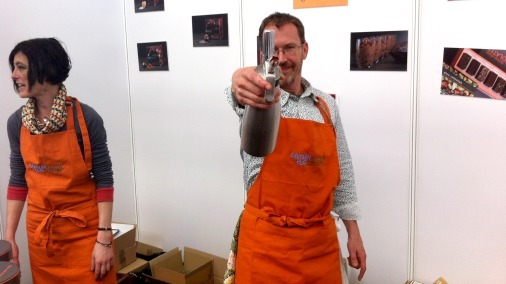 Served with the aid of a pressure gun, it is also great fun. 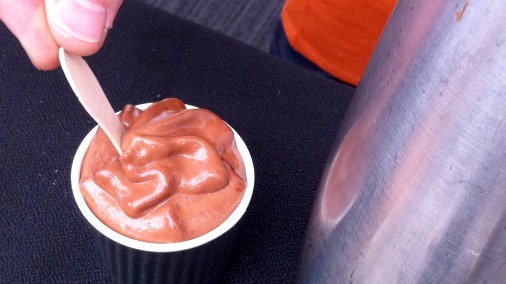 Damian Allsop’s innovative and delicious new hot chocolate foam! An unctuous, creamy treat, Damian Allsop’s hot chocolate foam manages also to be light and delicate, with an intense pure delivery of the fruity, green notes of the Ecuadorian cacao used in the Pacari chocolate. 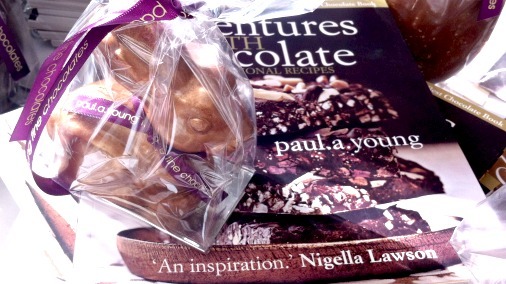 Books and Bunnies at Paul A Young. Lots of people had the opportunity to get down and dirty at the truffle rolling workshops held by chocolatiers from top London brand Paul A Young Fine Chocolates. A rare moment of relative quiet at the Rococo stall. 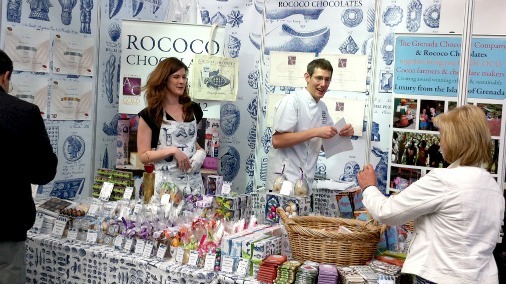 Barry Johnson from Rococo was very much in evidence, here seen behind the Rococo stand, which was rarely without a crowd of interested tasters and buyers. 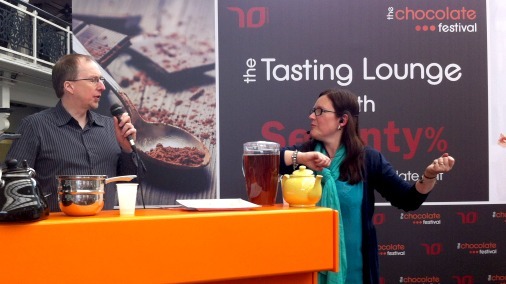 He and Rococo founder Chantal Coady also gave some of their famously good demonstrations in the tasting lounge. Beauty and taste at Rococo. Rococo are always exceptionally strong on visual design, and I was utterly enchanted by these painted eggs and those at the top of this piece. 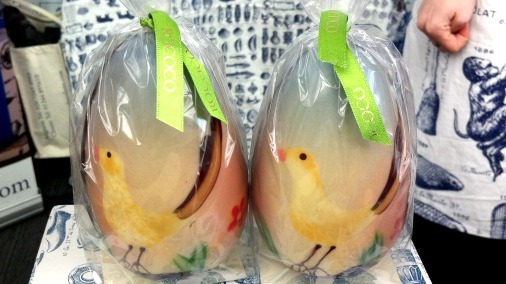 What must also be one of the most desirable Easter presents possible, and my own personal favourite, are the Rococo Paradise eggs newly out this year. 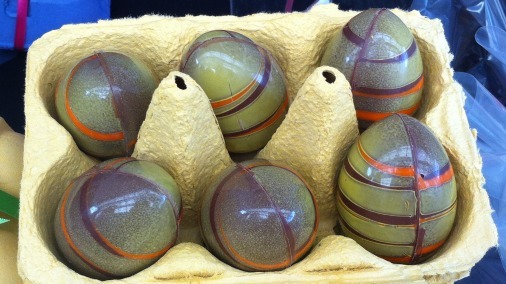 Twelve quail size eggs, each filled with Barry’s exceptional flavoured caramel, four each of three flavours. Two of them, the Kalamansi Lime and the Rosemary and Passionfruit, have deservedly won numerous awards. The newest member of the pack, Mandarin and Tonka bean, is equally good, with a similar balance of flavour, but marrying citrus and spice with more of a nod to warmth and some earthiness. Quite divine, if you have any chance of scoring a box do! 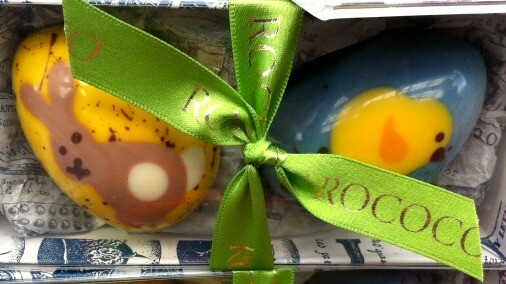 If not get down to Rococo nonetheless, they will be just as delicious in their regular shapes as they are in egg form. 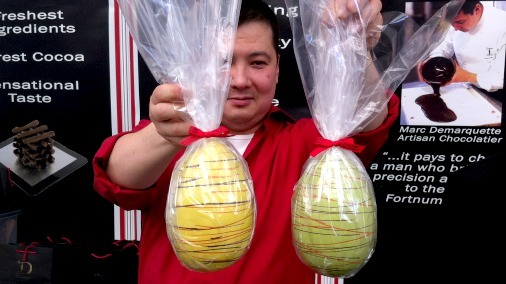 Marc Demarquette with his ‘Ostrich’ Eggs. London based Marc Demarquette had a great range of eggs, and his small caramel ‘Faberge’ eggs also deliciously featured flavoured and salted caramels. Everything is made with the couverture that Marc has a considerable hand in creating. I thought the eggs of all sizes truly elegant, and from experience I know they will taste as good as they look. A desirable box of eggs from Demarquette. I promise, the photos of these beauties don’t begin to do them justice. New hot chocolate from Sir Hans Sloane. 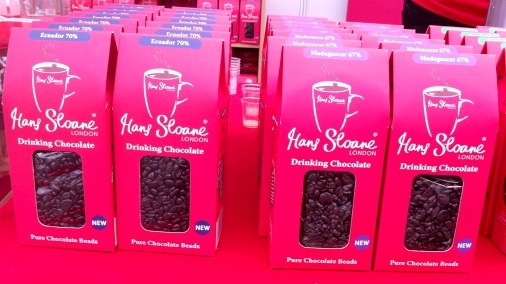 Sir Hans Sloane were debuting their new range of drinking hot chocolate. 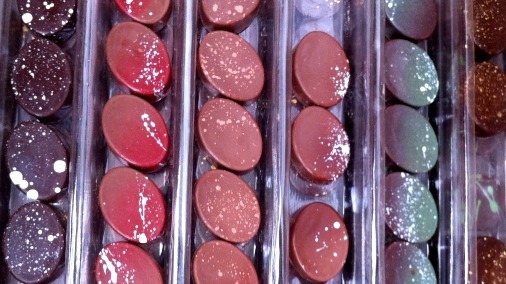 Bold Easter chocolates from Prestat. 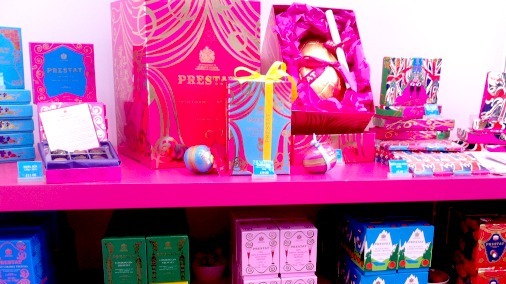 Prestat combined tradition with a very funky colour scheme. Rabot 1745 bars on the Hotel Chocolat stand. High street chocolate hero Hotel Chocolat was present showing to its strengths. 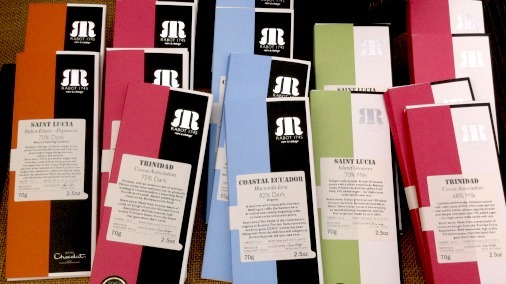 There was an array of their good single origin bars from the Rabot 1745 range, highlighting their attention to fine cacao and representing the top end of their commitment to bringing chocolate to one and all. Hotel Chocolat gorgeous new designs and an array of chocolate options. Hotel Chocolat also excel at seasonal designs and shapes. Their extra thick eggs are exactly what they say on the box, and are never likely to induce that awful disappointment to be found when all that wrapping is discarded to reveal nothing more than a thin empty shell. 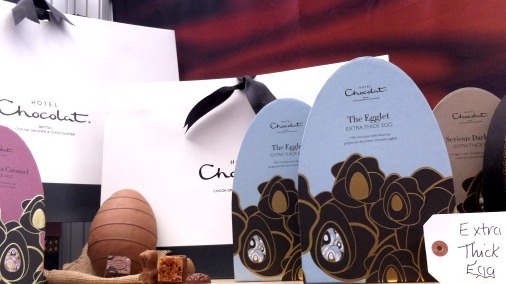 Hotel Chocolat eggs are almost obscenely chunky, packed with crowd-pleasing treats, and packaged like a dream. There was so much to enjoy, and in my opinion the indoor venue allows browsing at greater leisure, and the opportunity to include some fun new additional treats. If you missed it you know that the Christmas version will be upon us in frighteningly quick time. So now you know what is in store, I suggest putting those dates in your diary.